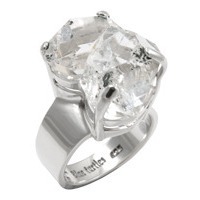 Herkimer diamonds sparkle brilliantly with their characteristic clarity and many natural facets. Though not really quite what their name suggests, these little jewels constitute an unusual mineral occurrence, created slowly over 300 million years. Their attractiveness and purifying nature have endeared them to many. Despite their name, Herkimer Diamonds are not in fact diamonds, but a unique, double terminated, stubby formation of quartz crystal. 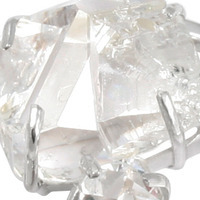 “Double terminated” means that the crystals form with two naturally faceted ends. Generally, crystals grow with one end anchored to the host rock, and the other end terminating in a faceted point. In this case, both ends of the crystal are free and thus end in points. Herkimer diamonds earned their name because of their resemblance to diamonds, thanks to their often-extraordinary clarity and the sparkle caused by their 18 natural facets. The adjective, “Herkimer”, refers to the limited range of Herkimer County in New York state, USA and surrounding area where they are found. There have since, though, been deposits of similarly double terminated quartz found in other regions, including Arizona USA, Mexico, Spain, Tibet and Afghanistan, but only specimens from the Herkimer vicinity can rightly be called Herkimer Diamonds. Herkimer diamonds are found in subterranean vugs or cavities in a rock formation known as “Little Falls” Dolostone, a Cambrian age sedimentary rock, which formed at the bottom of a shallow sea some 495 million years ago. Dolostone formed when sedimentary limestone (calcite) altered into dolomite, a calcium magnesium carbonate. The resultant combination of dolomite and calcite limestone constitutes dolostone. It is believed that the cavities in the dolostone, within which the herkimer crystals formed, were created when organic material trapped in the sediment, probably marine plants, slowly decomposed, leaving a void. A film of black anthraxolite on the internal surfaces of the cavities supports this theory. Anthraxolite is a carbon-based and coal-like substance usually derived from organic matter. 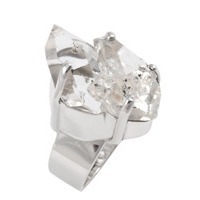 There are various theories about how Herkimer diamonds formed. According to one very strong theory, encased within the layers of dolostone were deposits of the abovementioned organic material, granules of quartz sand and pyrite (the pyrite was formed by bacteria). Over the next 200 million years, as further layers of sediment formed on top of the dolostone (to a final depth of about 5km), the pressure increased and the temperature of the dolostone slowly rose to around 180 degrees C.
With the increased temperatures, the organic material and quartz sand entrapped in the dolostone slowly began to dissolve and break apart. Over the following 300 million years, melting glaciers (post Ice Age) helped to erode the layers of sediment and the dolostone gradually cooled, allowing the silica-rich solution in the cavities to very slowly recrystallize. It was the very slow process of recrystallization that led to the characteristic clarity of Herkimer diamonds. Another theory suggests that silica-rich water seeping through the slowly cooling dolostone crystallized as it reached the cavities. The characteristic double terminations occur because quartz does not have an affinity with the dolostone, so it will not tend to be attracted to it. As the crystals grow, they avoid attaching to the host rock, and are free to grow into terminations at both ends. The clearest examples of Herkimer diamonds are usually the smallest specimens. They range from millimetres in size to over 20cm and the larger they grow, the cloudier they are and the more inclusions they tend to contain. Various types of minerals have been found as inclusions within Herkimer diamonds, the most common of these being anthraxolite. Herkimer diamonds with water trapped inside internal cavities are known as enhydros and are a collectors’ item. Analysis of these shows that the entrapped water is often salty, suggesting that there once was contact with the sea. A common habit of Herkimer diamonds is for them to form as clusters or bridge crystals (where one crystal is partly embedded in the other). It is not unusual to find two crystals conjoined side by side like siamese twins. The Mohawk and Iroquois people, indigenous to Herkimer County, knew about Herkimer diamonds and considered them to be “spirit stones”. They fashioned arrowheads and tools from specimens they found in streams and fields. The first modern record of herkimer diamonds was an article written in the “American Journal of Science” in 1819. Stories tell of people who had thought they struck it rich, until their finds were analyzed and were revealed to be quartz. Vast quantities of herkimer diamonds were unearthed when a road was cut into the region, and it was common for roadsides and driveways to sparkle with crystals that otherwise attracted no great interest. Over time the crystals became better known and coveted by collectors. Today the mines are very active, and some of them are open to the public, so collectors and enthusiasts can try their own hand at prospecting. 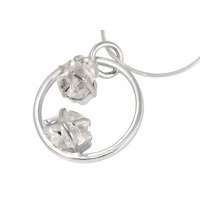 The energy of herkimer diamond is one of purifying, calming and restoring balance. It is said to emanate the brightest crystal light. Like quartz crystal in general, it acts as an amplifier of the energy of other stones. Herkimer diamond is attributed with helping us to clear unconscious fears and alleviate tension in the physical body, down to the deep tissue level, creating a sense of deep and true relaxation and wellbeing. It also activates the third eye and crown chakras, facilitating focused meditation. This makes it an excellent preparation stone for self-realization. In activating the third eye, it increases ones clairvoyance and psychic ability and facilitates access to the astral plane. It is credited with improving the lucidity and recall of dreams, and is often kept under the pillow or worn whilst sleeping. Herkimer diamond is suggested for those in the field of visual creativity – it inspires the imagination and triggers the flow of ideas. It is also considered a tool of manifestation. Referred to as an “attunement stone”, one can use herkimer diamond to keep attuned with a chosen person, a group of people or even a location. Herkimer diamonds will retain information, if one meditates with them and uses intent. Two or more people meditating together with the same intent, whilst holding a herkimer diamond each, are said to remain attuned to one another, even when separated. Doing the same with two crystals and leaving one behind in a chosen location is said to maintain a connection with that location. The degree of clarity or the types of inclusions in herkimer diamonds are said to have specific impacts on the energy of the crystals. Clear stones will clear blockages and debris, restoring ones aura with high frequency energy. 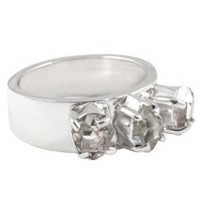 Included crystals help to cleanse the physical body, and lend stamina. 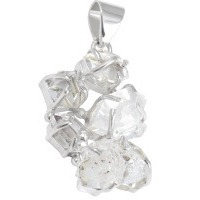 Enhydro herkimers (containing water inclusions) have a healing effect on the emotional body. Healers use herkimer crystals to unblock the flow of energy between chakras. Physically, herkimers are attributed with helping to rid the body of toxins, boost the immune system and balance the metabolism. It is also used to dissipate radiation.